I was leading a new member’s class in my first call when I asked people to share the story of who gave them their first Bible. Among the attendees was a woman in her early seventies. Dolores had gone to church most of her life so I wasn’t expecting what she would say. Her response was to say, “I’ve never had a Bible.” The day that she was received into membership, the congregation provided Dolores her very first Bible. This story has stuck with me for a couple reasons. First, I was astounded that Dolores had never owned a Bible. Second, we shed tears of joy when we gave her that Bible. In the words of Scripture, Philip’s prayer comes alive for us. 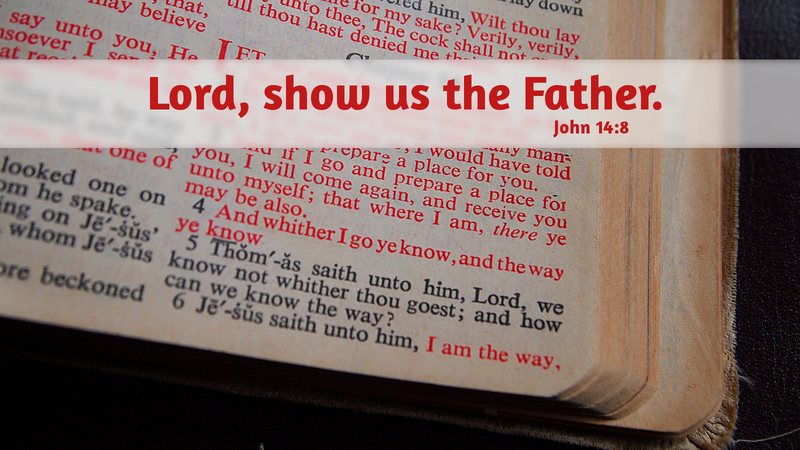 “Lord, show us the Father…” In the reading of Holy Scripture, the Holy Spirit reveals the love of our Heavenly Father. God is all about saving his chosen people, delivering them from Egypt as Pharaoh and his army pursued them, as well as delivering His chosen people today from sin, death, and the evil works of the devil, through Jesus Christ our Lord. Prayer: Heavenly Father, reveal yourself to us through the reading of the Holy Bible that we may see the good news of Jesus in our own lives.